The activists remain resistant! That was also apparent in Oaktown: one climate-justice warrior keeps Oaktown alive. Lying in his hammock, only equipped with a bag full of books, he managed not to give in to the police forces. In stead, the police, at least for now, seem to have given up, bringing him down from the tree. In the Westside of the occupation, the eviction notice was read out loud for the second time, and the eviction begun. Through several sitting-blockades and newly erected barricades, activists (including people from Aktion Unterholz) delayed and complicated the eviction. RWE begun cutting a path to the trees around Beechtown in the Westside. As people loudly yelled “stop it!”, a moment came, where the machines actually stopped. Maybe employees of RWE have begun thinking about their actions inside the 12,000 year old Hambach. In Cozy-town the mood of the activists in the trees is holding up, despite the violent destruction in the forest. Singing they showed their opposition to RWE and the police, and were forced to experience the destruction of their home, and the kidnapping of their comrades. Here the eviction is drawing into the night, as police has put up spotlights around the occupation. Four tree-houses here are still occupied. A cello-player also loud and clearly showed their solidarity with the occupiers of the Hambach forest. Playing a symphony from Bach, she was a wonderful example of the movements diversity. Only through the support from all edges, the eviction was possible to delay. Also our punk supporters came numerous to the forest. With a solidarity-concert from punk-bands Zen Mob and Mülheim Asozial, and singer-songwriter Conny, they made their feelings about environmental-destruction and climate-justice clear. “Beer against diggers, beer against Germany, beer against diggers and Germany!” blasted through to the otherwise calm evening-atmosphere on the Meadow. We want to make another thing clear: Even though the situation may seem calmer in the media, the insane eviction is violently continuing! 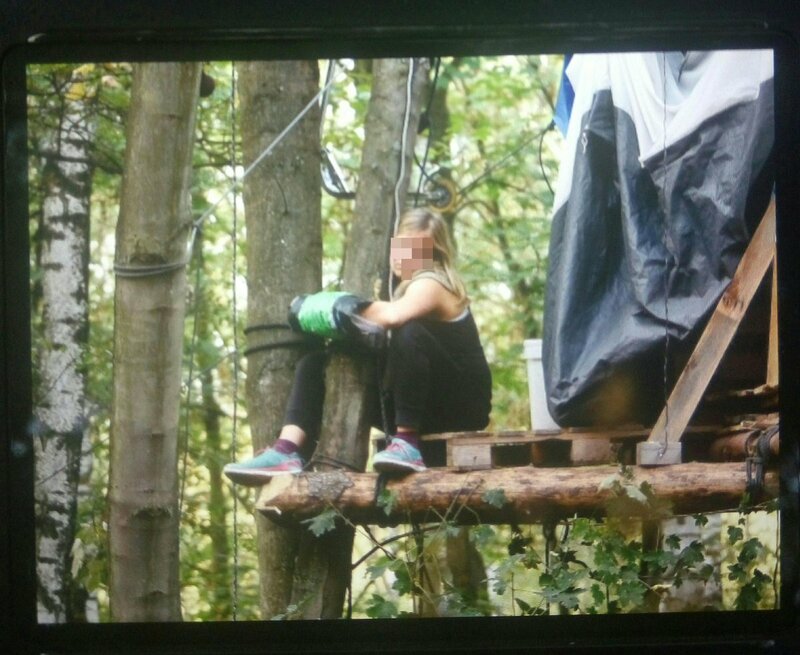 Police made sure that press-speakers were continually being kept away from the crime-scenes of RWE, but nonetheless all day more people are arriving, who are no longer willing to see the eco-terrorism of RWE and interior-minister of NRW Herbert Reul (CDU). Your presence and support gives the activists in the trees new power, motivation and courage, to continue in the common struggle for climate-justice here and now! Thanks to the strong atmosphere of the solidarity-concert tonight, we are ready for the next days, ready to continue opposing RWE and the police, and continue drawing a clear line for the people on the outside: Hambi stays, today and forever!